Against Denver on Saturday night, first-round draft choice Mike Hughes made enough plays to suggest he might be further along than we’d think. 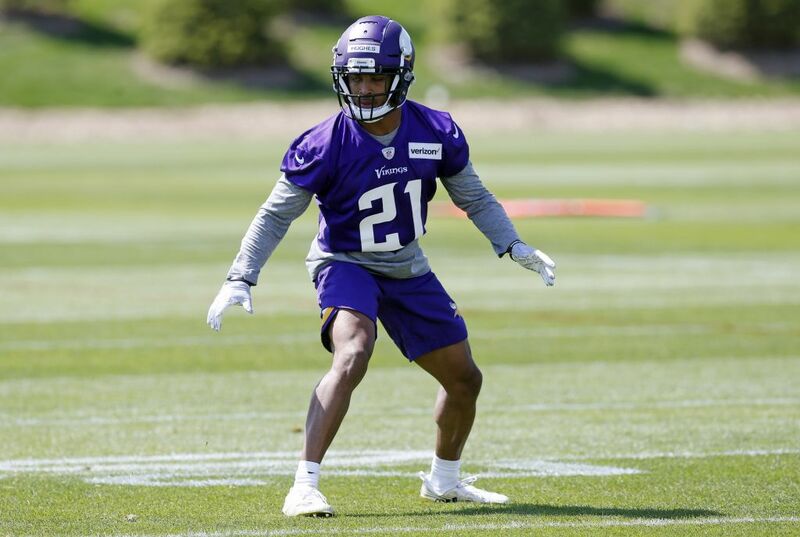 The common expectation with Mike Hughes, given the fact that the cornerback played one full season of major college football and the deliberate pace the Vikings typically use with their young corners, is that the first-round pick won’t play much on defense during his rookie year. That could still turn out to be the case as the Vikings’ season unfolds. But in the team’s first preseason game on Saturday night, Hughes made enough plays to suggest he might be further along than we’d think. He lined up in both the slot and at outside cornerback in Denver, stuffing a first-quarter screen to River Cracraft for no gain and nearly intercepting a Paxton Lynch pass before Broncos receiver DaeSean Hamilton reacted to break it up. Hughes played 29 snaps on defense, and worked as both a punt and kickoff returner. Marcus Sherels got the Vikings’ first two punt return attempts, but Hughes was back as the return man by the end of the first quarter, eventually fielding two for 11 return yards. As a kickoff returner, he brought back one for 16 yards after initially bobbling the kick and recovering. The Vikings kept Mackensie Alexander in the game after taking their defensive starters out, giving him a total of 11 snaps before sitting him down for the evening. He remains the team’s top option at nickel corner, but Hughes got plenty of opportunities to build on a solid camp on Saturday night. If nothing else, it never hurts to have an abundance of athletic corners who are ready to play, and Hughes could be heading in the right direction. Pass protection strong early, but slips after that: The Vikings’ offensive front has been a source of anxiety for fans during training camp, with Nick Easton headed for injured reserve, Pat Elflein still on the physically-unable-to-perform list and Mike Remmers dealing with an ankle injury. A makeshift starting five stood up well to the Broncos’ starting defense (sans Von Miller), protecting Kirk Cousins and opening holes for two big Latavius Murray runs on the Vikings’ opening touchdown drive. All of the starters other than left tackle Riley Reiff stayed in the game when Trevor Siemian replaced Cousins, and it was there that problems started. Rookie running back Mike Boone appeared to miss a blitz pickup on defensive back Will Parks, who came through the line untouched for a sack on Siemian after Boone reacted to outside pressure. Siemian was under pressure around both edges when he hit Roc Thomas for a 13-yard touchdown, and the Broncos got home with another blitz to sack Siemian in the second quarter with Thomas in the backfield. Especially with the Vikings still battling injuries on the line, it’s probably wise to expect mixed results. Receiver battle remains wide open: There are plenty of open spots behind Adam Thielen and Stefon Diggs on the Vikings’ wide receiver depth chart, and the most notable contenders for the team’s No. 3 receiver spot (Laquon Treadwell and Kendall Wright) had quiet nights in Denver. Treadwell played 41 snaps, more than any other receiver, but caught just one pass for three yards, while Wright had only one catch for nine yards. If anything, the Vikings’ younger receivers were the ones who provided more notable moments: Stacy Coley had a nice back-shoulder connection with Siemian for a 19-yard gain, Jake Wieneke caught a 16-yard pass and Chad Beebe showed off his crisp route-running skills on a touchdown catch to put the Vikings ahead for good. Brandon Zylstra, who missed the game while nursing a hamstring injury that’s thought to be relatively minor, can assert himself in the receiver battle if he can get back on the field soon. Vikings show off defensive line depth: Defensive line coach Andre Patterson has said his group this year is the deepest he’s ever had, and two of the Vikings’ young ends helped prove the point on Saturday. Third-year man Stephen Weatherly dropped into coverage on a 3rd-and-6, laying a big hit on tight end Austin Traylor to break up a pass, and second-year end Tashawn Bower used a nice power move to set up his second-quarter sack of Lynch. The Vikings rotated Jaleel Johnson and Ifeadi Odenigbo at the three-technique and nose tackle spots, giving both second-year players a chance to broaden their skill sets. Weatherly was flagged for roughing the passer in the fourth quarter, and rookie Ade Aruna was hit with a late unnecessary roughness penalty. Overall, though, the Vikings’ young linemen flashed their athletic ability and versatility, furthering the idea the team might be able to provide some breaks for Everson Griffen and Danielle Hunter this year. Special teams concerns: Coach Mike Zimmer said after the game the Vikings’ special teams units need to be better than they were on Saturday night, and particularly in the return game, special teams coordinator Mike Priefer will have some things to go over with his players this week. The Vikings gave up a 78-yard punt return touchdown to Isaiah McKenzie, whose initial hesitation appeared to draw the Vikings’ coverage team inside and open up space down the left sideline. They also had a puzzling moment on a kickoff return, when Cayleb Jones put his hand in the air to field a short kickoff and officials interpreted it as a fair catch. Zimmer said he thought Jones might have been trying to signal to Hughes that he would field the kick by putting his hand in the air; in any case, the coach was understandably nonplussed with the sequence that put the Vikings at their own 9-yard line. On a brighter note, rookie Daniel Carlson drilled a 57-yard field goal, saying afterward he’d played the crosswind in the north end zone of the stadium exactly how he’d hoped to do it. Up-and-down night for Tocho: Second-year safety Jack Tocho played 93 percent of the Vikings’ defensive snaps — a higher percentage of snaps from scrimmage than any other player on the roster — and had an eventful night for a variety of reasons. He tipped a pass to Anthony Harris for a first-quarter interception after Eric Wilson pressured Lynch, and Tocho came down with a pick of his own in the fourth quarter. But the former seventh-round pick appeared to miss an assignment on Chad Kelly’s 36-yard touchdown to Matt LaCosse.